Toothaches can be very painful — a pounding head, aching gums and a sore, tender mouth are among the symptoms — and it's essential that you see a dentist to get to the bottom of whatever is causing the ache. 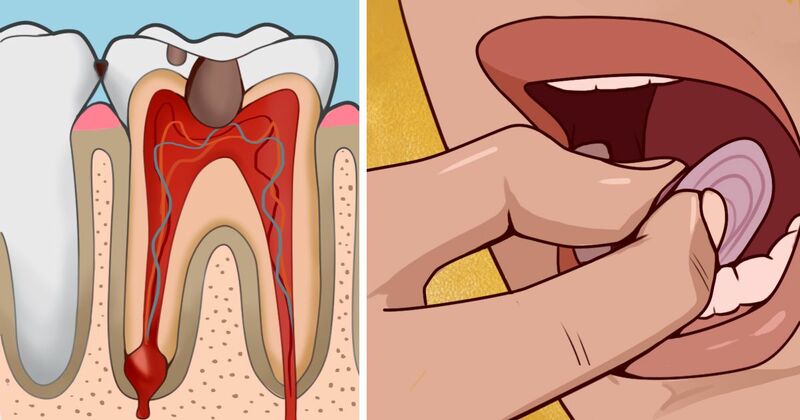 You could have an abscess, exposed nerves or compacted teeth. WebMD recommends that the best thing to do is gargle with saltwater (half a teaspoon of salt to 8 ounces of water). This works in two ways. Clove oil kills bacteria and has a numbing effect, according to Colgate. Dab clove oil directly onto your bad tooth or crush whole cloves until the oil releases, then hold the clove against your tooth. Reader's Digest recommends mixing equal parts of ginger and cayenne pepper with water to make a paste. Using a cotton ball, hold the paste on your sore tooth for as long as you can stand it. This will hurt — try to avoid your gums and tongue — but both spices are known painkillers. The chemical capsaicin (from cayenne) is known to help block pain messages from reaching the brain. Best Health Mag describes a folk remedy using a warm, wet tea bag for pain relief. It should be plain black tea — this contains tannins which have anti-inflammatory properties. Cut an onion into small, bite-sized pieces you can chew on. Chew on the onion piece for 2-3 minutes. The juice of the onion helps kill germs in the oral cavity. If you have a cracked tooth or a loose filling and are waiting to go to the dentist, Readers Digest suggests using chewing gum to patch up the break. This can protect the exposed nerves or the cavity from pain or further bacteria. WebMD recommends pressing an ice pack to your cheek for the temporary relief of pain and swelling. Another trick is to use ice: Hold an ice cube in your hand, on the same side of your body as the bad tooth. "Rub the ice in the space between your thumb and forefinger for 7 minutes or until the area turns numb." It's thought that the ice stops pain signals from travelling to your brain. Apart from being delicious, peppermint tea also has numbing power, according to Readers Digest. You can buy it or make it yourself, using a teaspoon of dried or fresh peppermint leaves and a cup of boiling water. Many people suggest using acupuncture pressure to relieve the pain of toothache, says Natural Living Ideas. There are pressure points in your face, hand and feet, as well as in many others, which may relieve the pain. You can see explanations and diagrams of a range of pressure points here. With antibacterial properties that help fight tooth decay and natural antibiotics that protect our teeth and gums from infection, wheatgrass is a useful plant in dealing with toothache. Natural Living Ideas suggests chewing the wheatgrass directly with the sore tooth, if possible. Alternatively you can use it as a mouthwash — it will absorb toxins, reduce bacteria and keep infection under control while you wait for the dentist. Top 10 Home Remedies suggests making a paste with equal parts salt and pepper, and a few drops of water. Apply the paste directly to the sensitive tooth. Both ingredients have antibacterial, anti-inflammatory and analgesic properties. It is vital that you make an appointment with a dentist if you're experiencing a bad toothache. Abscesses can become infected, and an infection in the mouth is dangerous. Toothache is extremely uncomfortable, though, and sometimes waiting for the dentist can feel like an eternity. Try some of these home remedies while you wait — people swear by them.